It seems that several years ago the J.E.B. Stuart Elementary School in Petersburg Virginia could be called a school in crisis. In 2006 this school was actually denied accreditation due to English and mathematics deficiencies on state assessments. Not only that, but much of the community is economically disadvantaged and 43% of the population is at the lowest possible literacy rate. Clearly a case of needing the brothers of Alpha Phi Alpha to ride in to the rescue with our local agency in Richmond Virginia. 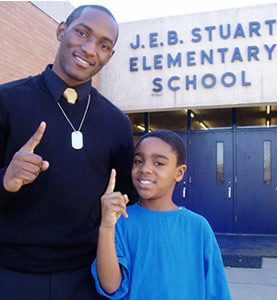 Motivated by Darryl Mathews’ call to action, and with the help of Sarah Gould, Tri-Cities Coordinator for Big Brothers Big Sisters Serves in Richmond, Alpha Phi Alpha partnered in a School-Based Mentoring program with J.E.B. Stuart Elementary School. They found a strong supporter in Principal Brenda Shelton who often uses the phrase "if it is to be, it’s up to me." Highly motivational words to motivate a collection of highly motivated brothers. So a collection of Alpha Phi Alpha brothers rode into town. They were matched with Little Brothers at the school. They met weekly, sometimes twice a week. They helped with schoolwork or just talked about things needing to be talked about. More of Principal Shelton’s words guided them, "People can achieve. All you have to do is set your mind and aim high." ​The meetings went on. Bigs and Littles developed relationships and brotherhood. The Littles knew they could count on the Bigs and the Bigs knew the Littles were counting on them. What a great example of what can be achieved! Little Brother Trey Shawn learned something big. If he works hard in school, he can get a schollarship and go to college. Which works out because he wants to be a doctor, just like his Big Brother Timothy James. An interesting thing happened at the school (there are always interesting things happening around Bigs and Littles. Sign up to experience it yourself. As you probably figured out, there were only so many Alpha Phi Alpha brothers to go around. But this small group was always around the school. It was like they each were more than one person. They taught not only their Littles but also the entire school through their dedication, perseverance, skills, energy and general good will. All the students looked forward to seeing them. And all the Alphas look forward to it, too. So much that they are all doing it. They are the only chapter with 100% membership as Bigs--the most in the country. One of the most important things the Alphas taught everyone is that to be an Alpha you never accept second best. The Littles as well as the rest of the students learned to strive to do their best, to aim high, to work hard, to be accountable. Having the Bigs there talking about and exemplifying these things helped the entire school change for the better. Attitudes improved, kids became excited to be in school, a positive atmosphere developed. Little Brother Damien thinks all the boys in school need Big Brothers "because they teach you fun things like geometry and how to do great things." Those Alphas sure are great role models. They are such great role models that the students not lucky enough to get a Big went home and told their parents they wanted their own Big too. So the parents came in to the school to find out how to get their child a Big. Now the Alphas speak at PTA and school board meetings. 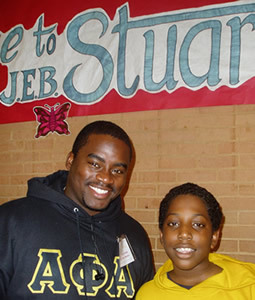 They even invite families to their Big Alpha events. That all happened in the 2006-2007 school year. Now even more Alphas are Bigs at the school—more than double, in fact. And next year Principal Shelton is hoping for an even larger contingent of Alpha Phi Alpha Bigs to descend on the school. She’d like one for each and every child in her school, all 550 of them. And so we leave you with Principal Shelton’s words, "You can just see the stars in their eyes when the Bigs come in. And when the Bigs come through the door it is as if they said ‘look at where I am and what I’m doing. This is something you can do, too. This is what you need in order to be successful.’ I’m looking forward to next year. Each year gets better." Well said Principal Shelton. And thank you Alpha Phi Alpha.